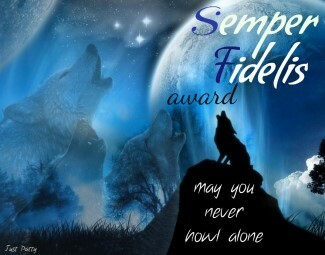 Patty says The “Semper Fidelis Award” means “Always Faithful” in English. 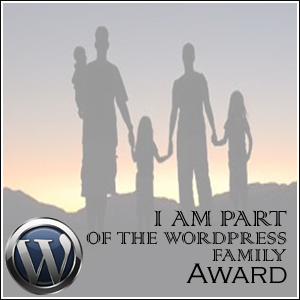 ”I created this award because I wanted to do something special for my friends on WordPress. Semper Fidelis is Latin and means Always Loyal. Loyalty means the world to me. I am very loyal myself, but I’ve got major trust issues as well. And I think trust is very important if you are sharing so much of yourself with people you meet through the internet. So I am working on that! 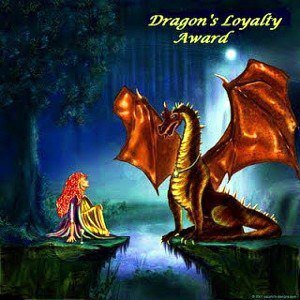 Nominate 5 bloggers whose loyalty and friendship you value and you consider being part of your ‘pack of wolves’ on WordPress. 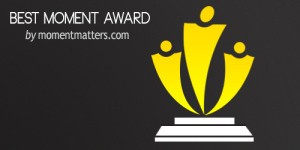 Post something special for all of your nominees separately and dedicate it to them. This can be a quote, saying, poem, picture, anything you think that would fit that person. I now nominate My Wolf Pack. Shaun, you are already one! I desperately tried to stick to the rules but I cannot! Please forgive me Patty and Shaun. I could add another 100 names to my acceptance and I would love to! I do not mean to slight anyone by not nominating you! I appreciate each and every one of my regular followers and friends! My treasured friend Sandra @ http://thedrsays.org/, who is terminally ill and still reaches out to me. This brave and selfless woman has to be the leader of my Wolf Pack. Thank you dear friend for caring when you have so much to deal with! You are always in my thoughts and prayers! http://behindthemaskofabuse.com is a heart wrenching blog about a woman’s life of abuse. She was raised by a narcissistic father, and a mother who rarely protected her from his verbal, mental, emotional and psychological abuse. She endured molestation, both inside and outside the family setting, raped at the tender age of 11 years old. This blog is written by an amazing person. A strong person battling recovery, anger and betrayal. She battles C-PTSD and BDD. Out of her pain two books were born and are published on Amazon “Buckwheatsrisk-Abuse Survival”, and a poetry book entitled “If I Could Write my Heart” I salute you! Yet this dear woman has so much love in her heart that she is able to reach to me. Thank you dear friend! http://idealisticrebel.wordpress.com/ – Rebel is amazing and takes on the world! A brave blogger who is a great friend. http://jmgoyder.com/ – My precious friend Julie who has so much pain and loss to work through. Julie writes about the love between her and her ailing husband. It is the most beautiful love story ever! Lots of love dear friend! Judy is my dear friend who has guided me through this abyss of grief that I am walking…http://myjourneysinsight.com Thank you dearest Judy for your guidance and love! Shirley @ http://justiceforraymond.wordpress.com is a true warrior, fighting for justice yet always ready to extend a hand of friendship and support. Thank you dear Shirley. Thank you dear Shaun for your generosity and friendship! Thank you Patty for coming up with this amazing award! 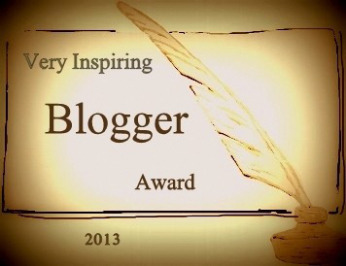 Thanks to http://prayingforoneday.wordpress.com/2013/03/19/the-very-inspiring-blogger-award/comment-page-2/#comment-2971 for THE VERY INSPIRING BLOGGER AWARD. Thank you Shaun! 1. I love the sea. 2. I am scared of spiders! 3. I was born with wings on my feet. I love travelling! The bloggers above have all have meaningful blogs that have enriched my life. I consider them friends and am grateful for their love and support. They are not the only bloggers that have supported me in my journey of grief but are the most frequent commenters. Go give them a visit. Thank you Shaun for the award and your continued support!